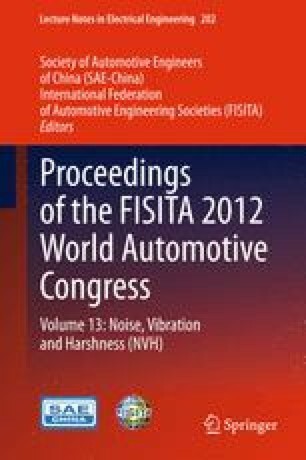 According to the spectral characteristics of vehicle intake orifice noise, the dominant noise contribution is identified in the range of frequency 800–1200 Hz. Based on the three-dimensional FEM method, the acoustic performance of the air cleaner is studied. The transmission loss of the air filter with additional chamber is improved in middle and high frequency. The acoustic attenuation of the additional chamber is related to the location and structure parameters. By increasing the cross-sectional area and the height of additional chamber, the acoustic attenuation bandwidth and amplitude are improved. Applied this procedure to the optimization of air cleaner structure, the results testified show that the procedure is reasonable and feasible. It can be applied in air cleaner design to increase the middle and high frequency of transmission loss of air intake systems. The authors gratefully acknowledge Dr. Pang Jian for his encouragement and guidance of during the writing of this paper.